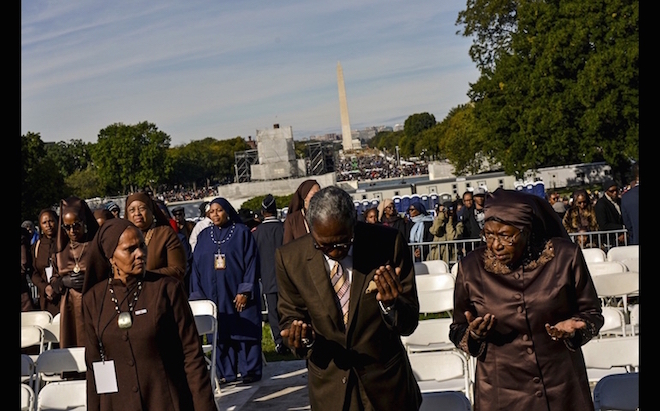 WASHINGTON Facing throngs of people on the National Mall, Nation of Islam Minister Louis Farrakhan called for justice Saturday, Oct. 10, as he rallied African-Americans, Latinos and others during an anniversary protest at the U.S. Capitol. His “Justice or Else!” event came 20 years after hundreds of thousands of black men came to the same stretch of lawn between the Capitol and the Washington Monument to rededicate themselves to being better fathers, sons and citizens. Farrakhan’s remarks were preceded by supporters of the “Black Lives Matter” movement along with Latino, Native American and Palestinian activists who took turns at the microphone urging better treatment. The Ku Klux Klan is emerging from decades of disorganization and obscurity, and the turnaround is acutely evident — more than 200 hate-related incidents have been reported since the Nov. 4 election. The Sant’Edigio community in Italy have voiced concerns after a string of attacks on migrants around the country in the past few days has left several people injured and one dead. In the last few days there have been racist attacks in Naples, Milan, Parma and Rome. Since I am a Japanese American, people are shocked when I tell them that my adoptive mother was the daughter of KKK members. I grew up surrounded by white supremacists.